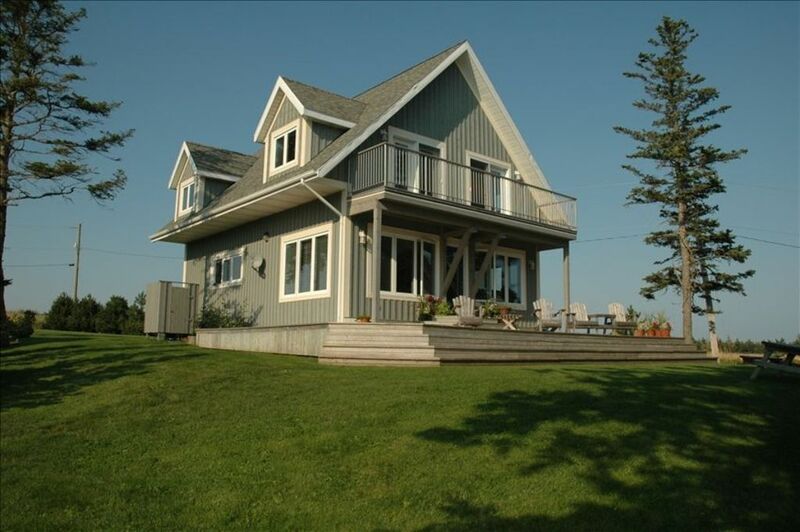 Executive beach house situated 75 feet from the oceanfront on the eastern coast of Prince Edward Island. The large, open concept, main level features a gourmet kitchen, dining room, and living room with wood fireplace. As you ascend the stairs you encounter a well-stocked library which offers something for everyone. All rooms upstairs feature cathedral ceilings. The master bedroom shares a deck with the guest room. The master bedroom has a king size bed and the guest room has a queen size bed. The third bedroom has two extra long twin beds. The large, four-piece bath features jacuzzi and separate shower. Our beach house offers an ideal setting to enjoy family and friends or to simply get away from it all. Beautiful home, amazing setting, private beach. Home has everything you need...Ultimate relaxation! Incredible home and beach. Pat is very kind and helpful. There is a well equipped kitchen - everything you would need. Living room includes a large it cozy wood-burning fireplace with red Island stone surround. Spacious bedrooms with high ceilings, great window seats, and a large balcony looking out over the ocean from two of the bedrooms. Outside has lots of beach chairs, kids toys, books, etc. Large BBQ and outdoor eating area with many Adirondack chairs. The warm outdoor shower is perfect after returning from the beach. We stayed the last week of August and swam in the ocean everyday. We celebrated my parents 40th wedding anniversary. We had 6 adults and 3 children under 3 yrs old and there was plenty of space. I highly recommend this property for a family summer vacation, and it is also fantastic in the shoulder season. Thank you for your wonderful review of The Cove. Look forward to hosting your family again. So glad you enjoyed your time at the cove. Come back any time. Thanks for leaving everything so nice. The Cove is the perfect beach house in every way! Thanks Renée for the great review. Come back any time. An amazing vacation spot for our family! Beautiful home, clean and modern with everything you need other than food-cooking ware, spices/herbs/oils, coffee machine, etc... Beach was incredible and the views from the house are spectacular! A short drive to Souris for tourist attractions. Views were amazing and our entire family had a great week. Pat made sure we were well looked after. Quiet, secluded, all around a wonderful week away from home! Thank you Stacey and Jason for your great review. Would love to have you back in the future. We couldn't ask for more gracious hosts or a better vacation spot for our family! It truly has become our home away from home. Thank you so much Pat and Wendell! See you again next year!! Thanks for the great review. Looking forward to seeing you next year. Pat has the perfect vacation home on the beach. Every room is thoughtfully stocked with everything you'd ever need while there. The only problem is that we didn't stay long enough. Thanks for the great review. Hope to see you next year.